The Leadership Book that Brings True Success! 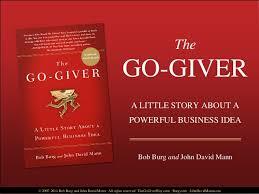 Maybe you’ve already read this book called The Go-Giver. I read it in one sitting as I found myself intrigued by each of the five principles outlined below. These keys for success are applicable to anyone, anywhere and we think they will be beneficial to you as you think strategically about how to grow your business and leadership teams. At DREAM Workplace we know how busy you are so we went ahead and gave you the “cliff notes” plus a question at the end of each law to help you tangibly apply each of these to your specific business and teams. The reality is when you exceed people’s expectations they’ll pay you even more. Show them that you want to continually add value and you’ll find they’ll go the extra mile for you! Does this service/product add value to others? Your compensation is directly proportional to how many lives you touch, and your level of compensation is under your control because if you want more success you can always find more ways to serve. How many people am I serving and in what capacity am I meeting their needs? Get good at watching out for what other people need, with the faith that when you do, you’ll get what you need in return. Changing your focus from seeing what you can get to what you can give is a key determining factor of how successful you’ll be. Have I identified 3 people this week who I can meet their specific needs? No matter what your training, no matter what your skills, no matter what area you’re in, YOU are your most important commodity. No matter what you think you’re selling, what you’re really offering is you! In my teams and with my customers am I bringing my whole self to the table? All the giving in the world won’t bring success and won’t create the results you want unless you make yourself willing and able to receive in like measure. Because if you don’t let yourself receive, you’re refusing the gifts of others and you shut down the flow. When others offer me help am I receiving it with thanksgiving? Now that you’ve grabbed a hold of these key principles you can not only motivate your team come Monday morning but also say you read a book over the holiday weekend!